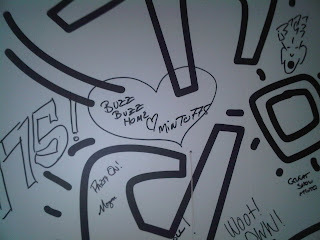 Last night was a great night for the BuzzBuzzHome crew – er, we didn’t have all the fun, it was a REALLY great night for Minto and purchasers of minto775! We put on our party hats and made our way down to King West where minto775 [map] held their ‘Epic Event’ to celebrate their start of construction. Minto went all out to ensure that attendees were treated to a memorable evening with entertainment being provided by the hottest new band around at the moment Down With Webster, which was fitting due to the trendy area we were in. A pretty impressive coup by any standards! Any construction party that we are invited along to in the future is going to have to do something pretty special to overtake minto775’s Epic Event, so developers of Canada, the bar has been set! Thanks to everyone at Minto for a fantastic evening and many congratulations on starting construction on what is sure to be a great addition to the area! We can’t wait for the next party! For more information on minto775 click here.